A startup from Bristol is relaunching a venerable item dear to old-time club cyclists. Il Soigneur musettes may be traditional in practicality but they’re thoroughly modern in spirit and execution. Back in the day, every self-respecting cycling club offered members a printed ‘bonk bag’ or musette so that riders could proclaim their fellowship while jauntily carrying a few essentials; a copy of Cycling Weekly perhaps, a few spare tubes and a change of shoes for the clubroom. Tell us if we’re wrong but that club printing tradition seems to have stopped while the need for a small bag of just-so size still carries on. Sure, there are endless options of courier bags and backpacks for commuting but they’re somehow….too big. That’s certainly what Dene Percy, a cyclist from Bristol thought. Combining the practical side of his nature with an eye for art, his Il Soigneur range of musettes has just gone on sale on the hand-makers’ website Etsy. Featured are a range of modern updates on the the theme of the traditional musette using fabrics such as waxed cotton, PVC, wool blends or waterproof canvas that not only look good but are also hardwearing and generally up to the job. The webbing straps are wide and anatomically placed to keep the bag where its supposed to be and a generous metre in length. The bags get stress reinforcement in all the right places, chunky press stud fastenings and finally there’s a cute badge and reflective tab. Overall size is 36cm x 27cm. There are 12 designs, all at £28, ranging from the simple yellow “Oo Wipe Clean” to the wackier art fabric “Grayson You Mentalist” – fabric design by Grayson Perry – but what they all share is old-fashioned bespoke quality. There are more bags and cycling caps to come. The respected south coast bike brand Whyte has been gradually branching out from its roots in fully suspended mountain bikes and last year offered some very well-reviewed utility city bikes which managed to retain the purposeful clean-and-techie look of their off-road cousins. 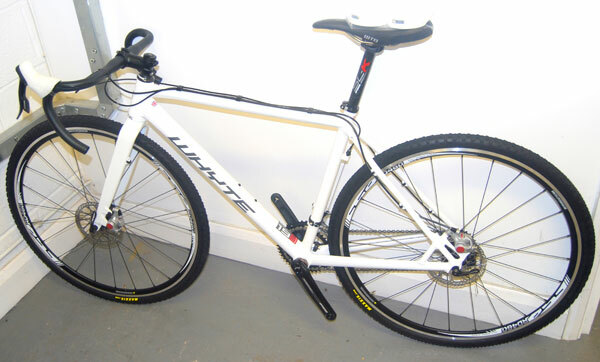 It’s a sign their ambitions aren’t stopping there that this week they’ve leaked photographs of a cyclo-cross bike they’ll be running under their team rider Billy Whenman at this weekend’s CX Sportive in the lovely area between Reading and Oxford. The frame is made from hydroformed aluminium which suggests they’re shooting for a sensible price but the big story is the disc brakes which, of course, Whyte will be well used to dealing with on their off-roaders and now the UCI says we can use for cyclo-cross racing. 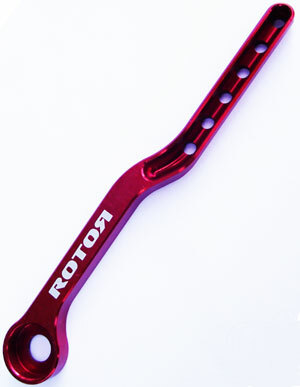 The main delay, and the reason there haven’t been more disc brakes on this winter’s pro bikes is that suitable forks with brake studs and sufficient clearance for mud and ‘cross tyres have had to be designed, prototyped and tested before they could be unleashed on innocent team racers and, even more importantly, the paying general public. We’ve already seen one sneak peek this week of the new 3T Luteus carbon cyclo-cross fork with the brake cable routed down the outside of the fork leg; this one on the Whyte looks like it has the cable guides in a better position to the rear. They’re being coy at Whyte but we can safely say two things. One; there’s a production race-ready Whyte CX bike coming. Secondly; Whyte are just crazy enough to be the first company that offers a production tarmac racer with discs. Can’t wait. 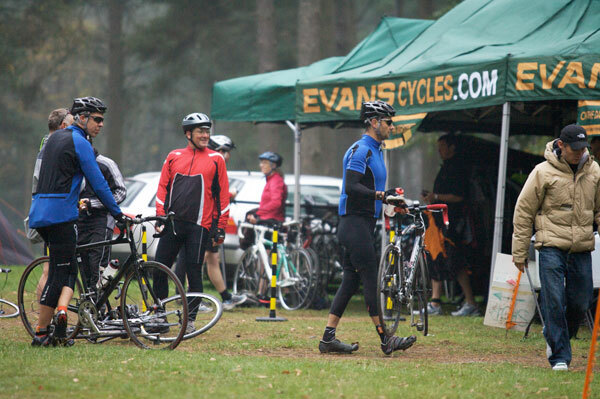 Evans Cycles is hosting what it hopes will be the largest bike demo day in the country on the weekend of 19th and 20th March 2011. With over 40 bike shops and a huge mailorder operation, it’s no surprise that most of the largest manufacturers will be there to support them, offering demo rides on a safe closed road circuit as well as forest tracks at the Redbridge Cycling Centre near Chigwell in East London. In addition, there are sportive rides on both days with Saturday the day for enthusiasts and a choice of 30, 60 or 90 miles. On Sunday, there is a 10 mile fun ride where Evans are encouraging everyone to ride, especially family and friends. Entry to the sportive rides costs £15 or £5 to the demo exhibition only. Accompanied children are free. The M.A.D. mountain bike display team will be in action with their stunt display and coaching sessions. There will also be FixIt! bike maintenance sessions running throughout the weekend as well as lots of other fun free activities for all the family including face painting and a bouncy castle. Brands exhibiting and offering demos will include Trek, Scott, BMC, Fuji, Colnago, Cannondale, Lapierre, Santa Cruz, Niner, Brompton, Garmin, USE, Cateye, Polar, Gore Bike Wear, Endura, Helly Hansen and Fox. It will also be the official launch weekend of the 2011 Pinnacle bikes, Evans’s own house brand that focusses on extreme good value. The free iPhone app Rendezvous is designed to make hooking up for rides with like-minded cyclists a doddle. According to clothing company Rapha, that developed it, the idea is to log in and either see what other Rendezvous members have organised or, even better, start your own ride which other riders can sign up for. The app was launched last September and since then 10,000 cyclists in 44 countries have downloaded it. “A strong community has grown around Rendezvous, with clubs and groups organising their regular Sunday runs and training rides through the app,” says the company. An update last week now means that even people who don’t have an iPhone can benefit because the posts can be shared with Twitter and Facebook. ProTour team Garmin-Cervélo has signed a renewed three year contract with Spanish components manufacturer Rotor to supply its distinctive Q-Rings, 3D+ cranks, bottom brackets and chain catchers. The chain catcher is new and for £20 could make all the difference between you or your rival finishing 10 seconds behind due to an unshipped chain. It’s made from machined 7075 T6 aluminium, weighs 6 grams and, according to Rotor, was developed with the close help of last year’s Cervélo Test Team.